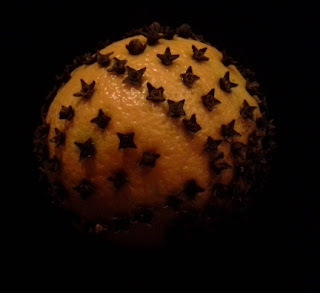 A year ago I stuck some cloves in an orange and forgot to eat a pomegranate. These pretty decorations were the results. I think it would be awesome to make a bunch of these and use them instead of those styrofoam balls on a tree. Making the clove orange is easy, but a little time consuming. Make holes in a nifty design with a metal skewer and stick the cloves in those hole. I took the cute, little, powder-filled balls off the top of my cloves so it would be less messy. I don't know how this would work in a damper climate, but my two fruits dried beautifully. We have a dried bagel in our house. Our boys really like them and they placed on on Papa's shrine. It's hard as a rock lol. Still looks good but not as beautiful as that orange. I bet it smells good!